One amateur astronomer's Impressions (See bottom of page for current OSP info, mileage logs, and links). In recent years, the OSP's attendance runs between 500 and 700 men, women, children and pets. Our planned 2017 SOLAR ECLIPSE star party, however, was so large that it was limited to 900 registrants! The picture above is the 1998 Group Photo, which was six years after we moved to our current 5000 ft. high site in the Ochoco Mountains of Eastern Oregon. The 1998 photo attendance was 610, out of which 166 got out of bed to pose for the annual Group photo. That year the Swayze-built 40 inch Dobsonian Telescope gave eye-popping views of the heavens to anyone brave enough to ascend the lofty aluminum ladder to its giant 2" eyepiece; it was a true Stairway to Heaven.... OMSI, Oregon's premier science museum, helps sponsor the event every year.... The Rose City Astronomers, Oregon's largest club, is also heavily involved (see more at bottom of page)... I have been the official Group Photographer since 1989, and all the past years' photos are available for ordering (brucej@Oregonphotos.com). 2018. The year of Climate Change Writ large. 111 people and 4 dogs showed up for our 2018 Group Photo. Click image for larger version, plus a closeup of Chuck and Judy Dethloff and other long-timers such as Jan Kieski. Look at Bruce's doppelganger in the larger picture; he is an amazing likeness of Bruce Johnson. All the digital downloads and prints were sent by Sept. 29th. See you all next year. 2017. A Total Solar Eclipse graced the OSP this year! We had enormous attendance, 880 souls. Here's the 2017 Group Photo. It had 152 persons in it. The 2016 Photo shoot drew 118 persons and was held under sunny skies and enjoyed moderate temperatures. It's the first Group Photo in several years to be oriented to show the LIGHTNING TREE in the background. The 2016 OSP as a whole drew close to 590 persons! Click on the picture to see a larger version and additional pictures from 2016! Click here for link to group photos from 2015 far back into the past, all the way to 1988 at Steens Mountain! Click here for a big selection of OSP images dating back to 1988, at our original site high on the Steens Mountain. Also now included is a link to Rob Brown's "Dead Tree Chronicles,"and to Gary and Carolyn Strongs' discovery of our new site at Indian Trail Springs! Latest addition is a guided tour of the waters of the actual Indian Trail spring itself. Also take a look at some classic OSP stickers. Here's the promised 360-degree panorama of the 1999 Oregon Star Party, taken from high atop the roof of Chuck and Judy's RV. See if you can pick out your campsite and scope, and those of your friends! Note: recently, I have added also a Panorama of the site from 2009! OSP Recreation-- Mars Rover Races and Zing Wings! Huge, Spectacular image of Leonids 2001 Fireball-- use as your screensaver! See a Panorama of this author's (former) astronomy property located 12 miles south of Prineville, Oregon (about 30 air miles southwest of the OSP site). Canyonland, Bruce Johnson's own Astro Retreat! April 2008. Click below for the latest news and developments from Highgate Farm Star Party. This site is a 100 acre farm on the southern fringe of the Portland Metro Area that is being considered as a permanent "nearby" viewing site by RCA. Is Global Warming Gradually Messing up Astronomy in Oregon? 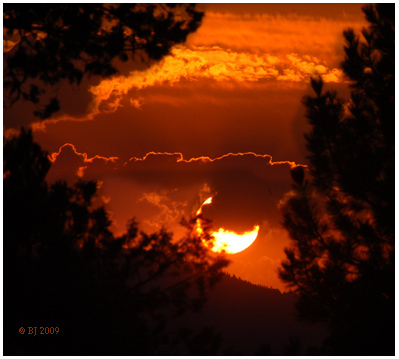 Every astronomer needs to know the exact times of their local sunrise and sunset , and what phase that troublesome Moon is in, so click now! Read the little-known pre-history of the establishment of Pine Mountain Observatory, includes link to Pine Moutain's year-round, live-action Webcam where at times you can see fellow astronomers setting up and taking down their star parties! Is there a link between Ice Ages on Earth and Solar Activity? Click this link to Order "The Oregon Weather Book" by George Taylor and Raymond F. Hatton, with photos and some research by myself, Bruce Johnson. Go to the summit of Mauna Kea, Hawaii, and witness 200 brave OSP astronomers, and see Jan Kieski up there for real in 2017! Sunset at OSP 2009, a Thursday. or e-Mail them at: OSP Inc.
Rose City Astronomers' members have many great individual websites: click here to see the listings! The Starry Messenger magazine, a historical remembrance! And Galileo's connection to this magazine! Haggart Observatory- Big Scopes in Oregon City! (Ochoco Mtns, at Indian Trail Springs (ITS)... Note: Google Earth maps locate our site as being on "National Forest Develop Road 800," and also show it as "Fox Reservoir Road"...They display our altitude as 5,030 feet... They show the road to Indian Trail Springs as "North Fork Road," but do not label the spring itself. .. The aerial maps are so good that if we'd been on-site when the photos were taken, you could have clearly seen our cars and the bigger scopes! side of Portland is this?). Just call it "about 200 miles" is my vote. 25-40 more miles up to the Mtn. itself. Olympia to the cute little resort/mountain town of Packwood is about 105 miles, elev. Mileage Log going east via Hwy 12 and Yakima, Hwy 97, and then up to OSP site. Add the above, gives 196 miles between OSP and Portland (but which side of Portland is this?). Just call it "about 200 miles" is my vote. OSP BACK TO OLYMPIA VIA GOVERNMENT CAMP, I-205 AND I-5 = 302 miles.